Sarah Nader - snader@shawmedia.com Huntley's Autumn Kasal (left) tags out Hampshire's Sarah Bowen during the third inning of Monday's game May 8, 2017 at Huntley High School. Huntley won, 11-1 in five innings. Sarah Nader - snader@shawmedia.com Hampshire's Peyton De Chant (left) misses the pass while Huntley's Sofia Tenuta safely slides to third during the fourth inning of Monday's game May 8, 2017 at Huntley High School. Huntley won, 11-1 in five innings. 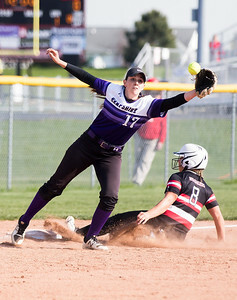 Sarah Nader - snader@shawmedia.com Hampshire's Morgan Haefling (left) holds the ball while Huntley's Teagan O'Rilley is out in the second inning of Monday's game May 8, 2017 at Huntley High School. Huntley won, 11-1 in five innings. Sarah Nader - snader@shawmedia.com Huntley's Tiffany Giese pitches during Monday's game against Hampshire May 8, 2017 at Huntley High School. Huntley won, 11-1 in five innings. 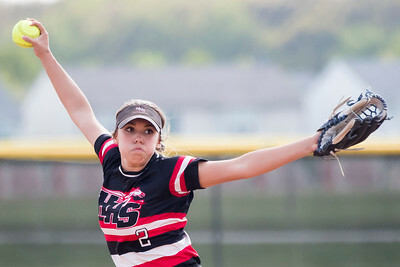 Sarah Nader - snader@shawmedia.com Hampshire's Jasmine Lopez pitches during Monday's game against Huntley May 8, 2017 at Huntley High School. Huntley won, 11-1 in five innings. 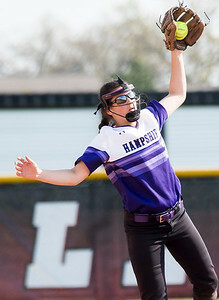 Sarah Nader - snader@shawmedia.com Hampshire's Gwenyth Malecke catches a ball during the third inning of Monday's game against Huntley May 8, 2017 at Huntley High School. Huntley won, 11-1 in five innings. 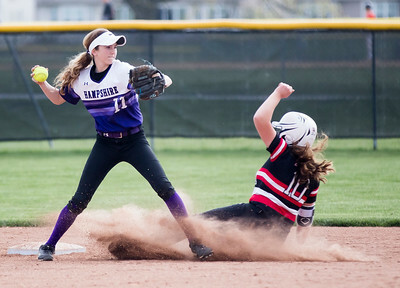 Sarah Nader - snader@shawmedia.com Hampshire's Delaney Rummell slides home during the third inning of Monday's game against Huntley May 8, 2017 at Huntley High School. Huntley won, 11-1 in five innings. 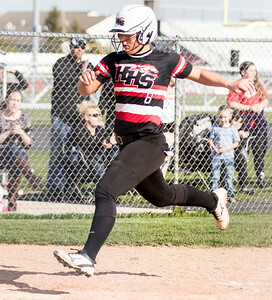 Sarah Nader - snader@shawmedia.com Huntley's Sofia Tenuta safely runs home during the fourth inning of Monday's game against Hampshire May 8, 2017 at Huntley High School. Huntley won, 11-1 in five innings. 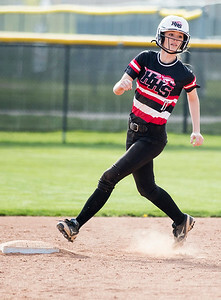 Sarah Nader - snader@shawmedia.com Huntley's Kateri Conklin runs to second during the second inning of Monday's game against Hampshire May 8, 2017 at Huntley High School. Huntley won, 11-1 in five innings. 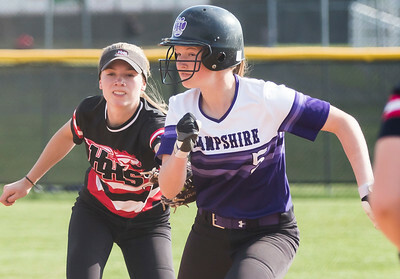 Huntley's Autumn Kasal (left) tags out Hampshire's Sarah Bowen during the third inning of Monday's game May 8, 2017 at Huntley High School. Huntley won, 11-1 in five innings.